I have held off on paying to have my DNA test done because I have most of our lines so far back that I really didn’t think it would tell me much that I didn’t already know. There were a few families that we know were from Ireland, but not sure exactly where. Those were the only facts that I wondered if a DNA test would clear up. My sisters and I discussed going in on the price of one test and having one of us take it. Shortly after that discussion, there was an article about how DNA tests can vary between siblings. My sister, Lois, volunteered at that time to pay for a test for herself. I looked forward to seeing her results. Her results showed her ancestry as being 96% from British Isles. No surprise there at all. The company she used didn’t really differentiate Ireland from the rest of the British Isles. Nothing in her results made me think it was worth doing a test myself. Recently Ancestry.com reduced the cost of their DNA tests, so in the hopes of getting more specificity, I decided to go for it. 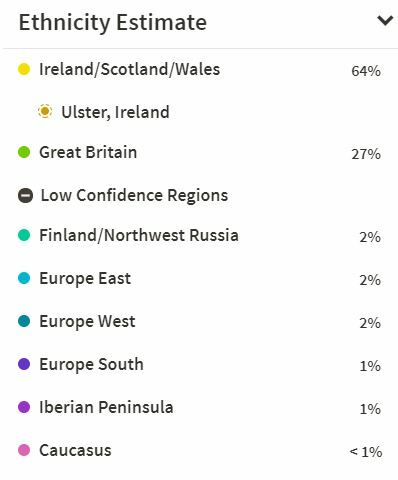 I recently got my results back, and while I haven’t explored all of the information yet, I can safely say that while the results were more location specific than my sister’s were, there still were no big surprises. The largest percentage of my ancestry, 64%, was from Ireland, Scotland and Wales. Ancestry notes that we probably have ancestors from the Ulster area of Ireland. (*Note: All of what is now “Northern Ireland” is a part of “Ulster”, however not all counties in Ulster are a part of Northern Ireland) The “Ulster” connection makes sense since our Bannon family was from County Fermanagh (a part of current Northern Ireland). Our Stanford and Carroll families lived in County Leitrim (a part of Ireland) which borders Fermanagh. The Morgan, Bevan et. al side of my mother’s family was from Glamorgan, Wales. As for the 27% Great Britain, we have ancestors from Lincolnshire, Cheshire, Devon and Cornwall. Cornwall being another Celtic stronghold like Wales and Ireland. I’ve always said that while we were basically half Irish half British (including Wales in Britain), we are 99% Celtic. These results pretty much back that up. Here is the “large” map showing all of the possible areas that my ancestors may have originated from. I’ll delve in to some of the “small percentage” areas later. 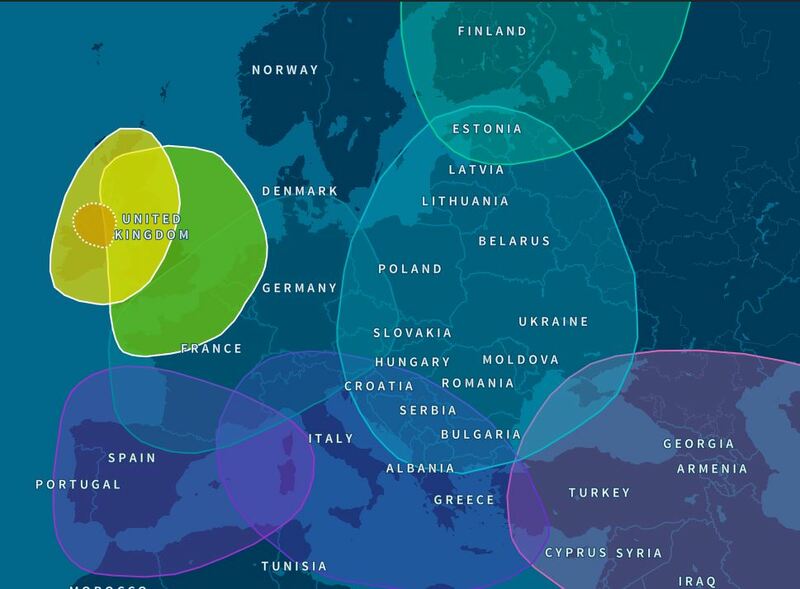 Focusing on the British Isles for now, I decided to show how the known locations of our families lined up in comparison with where the Ancestry DNA map said they were. I took the results map and superimposed it on a map of the British Isles and put stars where our families lived. You’ll see that there are two stars that fall in what the map considers “Ulster”. The higher one is County Fermanagh (Bannon) and the lower one is County Leitrim (Stanford and Carroll). would be connected to our ancestors who lived in Lincolnshire. I found this interesting article on Ancestry.com called “The Viking in the Room”. They posted the graphic on the right that shows the highest concentrations of Scandinavian ancestry in Great Britain. I put a yellow star on Lincolnshire, which you’ll see is in one the “reddest” sections of the map. Across Great Britain there is a clear pattern with higher Scandinavian genetic ethnicity in the north east of England decreasing as you get further from that region. From a high of 11.1% in the Northeast of England the average drops to a low of 6.5% in Southern Scotland. When I had first viewed my sister’s results I found this map that shows the Viking invasion of Great Britain. As you can see from the yellow star, they landed right in Lincolnshire. The county still has many placenames with Scandinavian origins and there are many surnames, such as our Harrisons, with classic Scandinavian patronymic patterns. 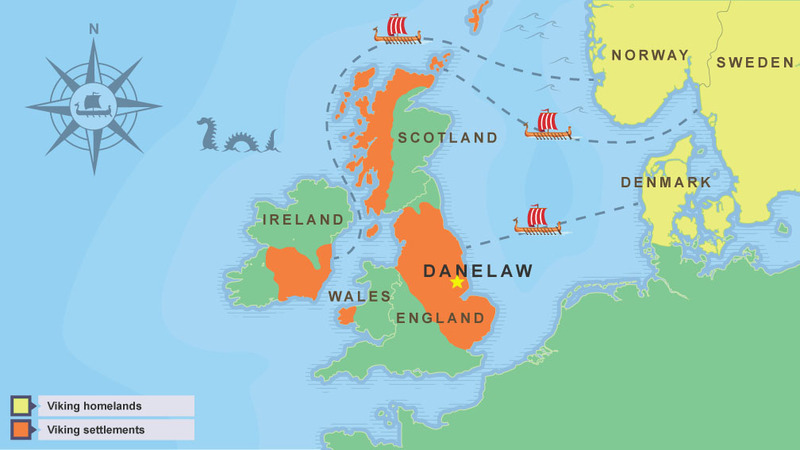 As the Romans left Britain from 400 A.D., tribes from northern Germany and Denmark seized the opportunity to step in. The Angles (green) and Saxons (purple) soon controlled much of the territory that had been under Roman rule, while the Jutes (orange) occupied some smaller areas in the south. This last bit of research in to my DNA results was the most interesting. 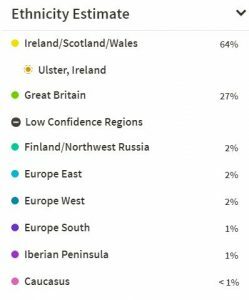 My DNA results show 1-2% findings for parts of Europe, the Iberian Peninsula and “Caucasus”. My sister’s results had shown a small percentage in the area of Isreal. 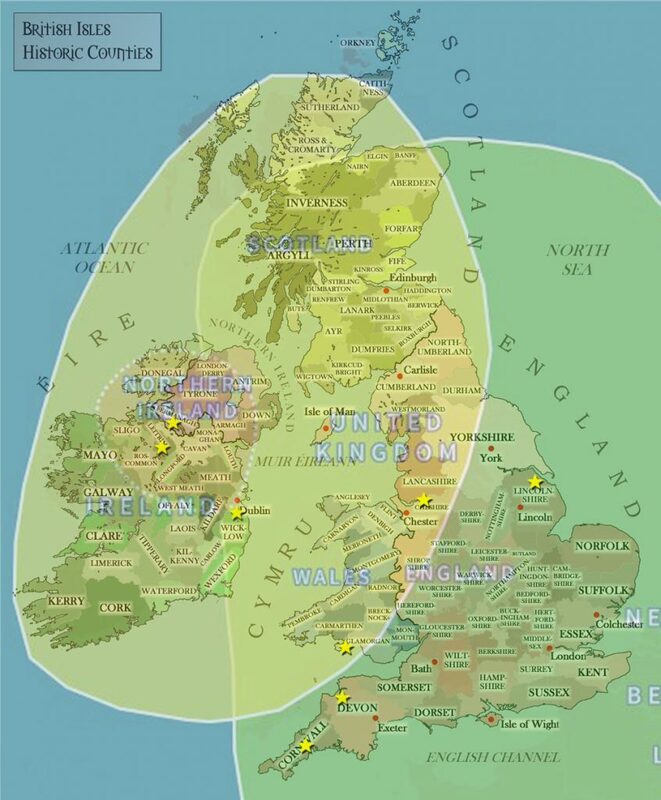 I believe that all of these locations have to do with the migration of the ancient Celts. The mention of “Eastern Russia” in the “higher percentage” results may also link to the ancient migrations. 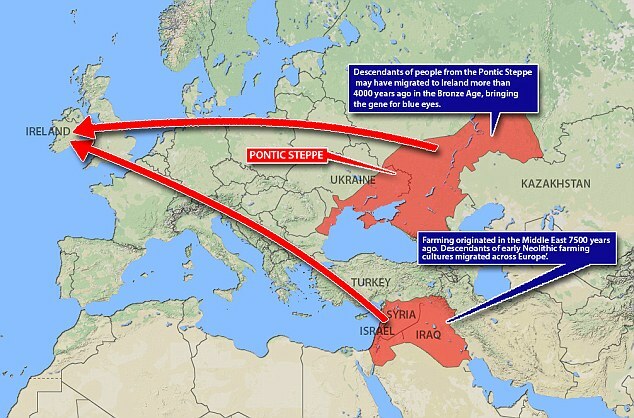 One of the most interesting articles that I found concerning the migration of ancient peoples to Ireland was this one from the Daily Mail: Irish people originate from the MIDDLE EAST: Celtic DNA shows farming led to a ‘wave of immigrants’ entering Ireland 4,000 years ago”. Researchers compared the DNA of an early Neolithic farmer, a woman who is believed to have lived in the Belfast area 5,200 years ago and that of three men found in Rathlin Island in County Down, who lived 4,000 years ago during the Bronze Age. The map below, courtesy of irishstory.com (no longer a website) shows the migration of the ancient Celts to both the Iberian Peninsula and Great Britain. When the Romans invaded later, they drove the Celts to the West. They mainly settled in Ireland, Scotland Wales and Cornwall. In conclusion I am happy that the DNA results match up so well with my genealogy research. I’d hate it if I was like the guy on the ad who finds out that he wasn’t German, but actually Scottish. I’d have to throw out years of research!! I am disappointed that there are no real clues as to where some of the families for whom I have no definite location in Ireland came from. I may never know where our “second Carroll” line was from before migrating to New Haven, CT via Austrailia. I may not find out where Charles Smith’s parents were from before they moved to New York City. I am also in the process of contacting some of the people with whom I “matched” as cousins. I’ve already discovered that my Great Grandmother’s (Mary Elizabeth Kieft Ratcliffe) brother may have had an illegitimate daughter that we never knew about. While there were no other big surprises, I’m still happy that I finally gave in and had my DNA analysis done. I’ll keep you posted if it leads to any new exciting discoveries.